For those not familiar with sea stacks, they are “humps” of rock formed by wave and/or wind erosion of the surrounding rock. There are some excellent very large examples along the Oregon coast. 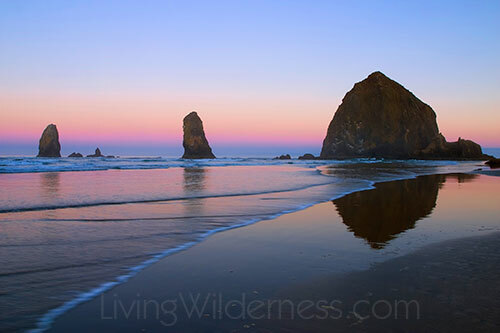 Haystack Rock (on the right) is a very prominent sea stack at Cannon Beach on the Oregon Coast. At 235-feet, it is the third-tallest sea stack in the world. Back to Indiana. 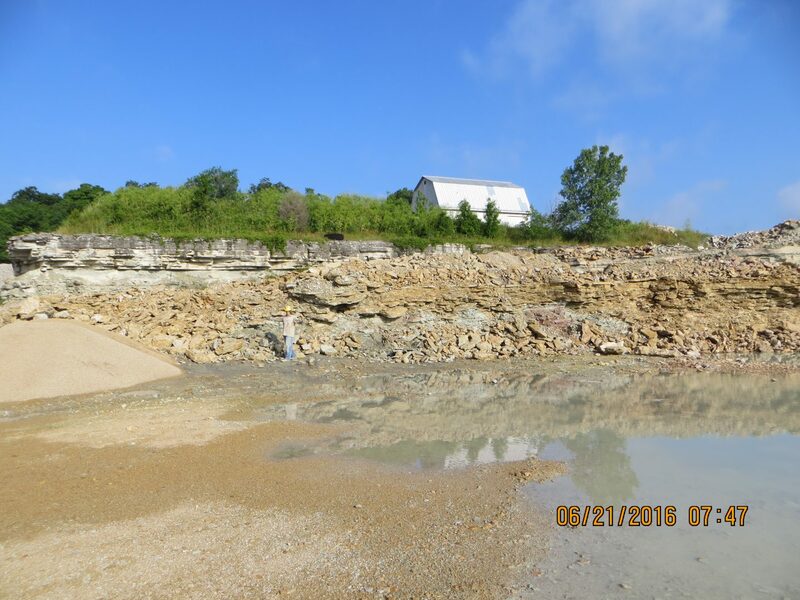 Over the past few years, what we have informally called “sea stacks” have been exposed in a quarry in Indiana (see example picture). Like humps on a camel, they protrude into the Silurian Brassfield Limestone, which sits on top of the Ordovician (likely Whitewater Formation). These gray-purple structures contrast with the golden color of the surrounding limestone. While not as giant as Haystack Rock in Oregon, the Indiana stacks have been several feet across, with one of them reaching about 10 feet tall, extending to the very top of the Brassfield. Sea stack protruding into the Silurian “Golden” Brassfield Limestone in Ripley County, Indiana. I’ve been collecting this quarry for over 35 years – never saw sea stacks in the past. And the quarry manager (who has worked there for decades) stated he and his father before him had never previously seen them either (the quarry has been in operation since at least the 1960s). So a unique occurrence. Over the past few years, Tom Bantel and I have examined these many times, and discussed them with local professionals. 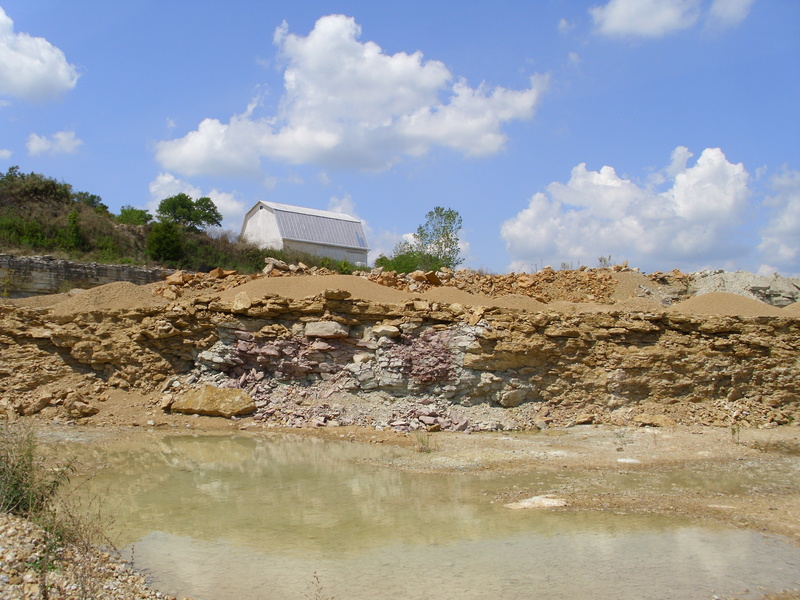 Dr. Carl Brett (UC) has joined us at the quarry several times to discuss various projects. One was to study these stacks, which he suspects are Ordovician in age. That conclusion is based primarily on the presence of Rafinesquina brachiopods and Isotelus trilobites, neither of which are known to have survived the mass extinction event at the end of the Ordovician period. And from his examination of the strata at the base of the stacks, it grades uniformly from the underlying Ordovician Whitewater Formation into the stacks (no sharp boundary like there is between the Whitewater and the Brassfield above). Dr. Mark Kleffner and his colleagues (OSU) have also joined us at the quarry. 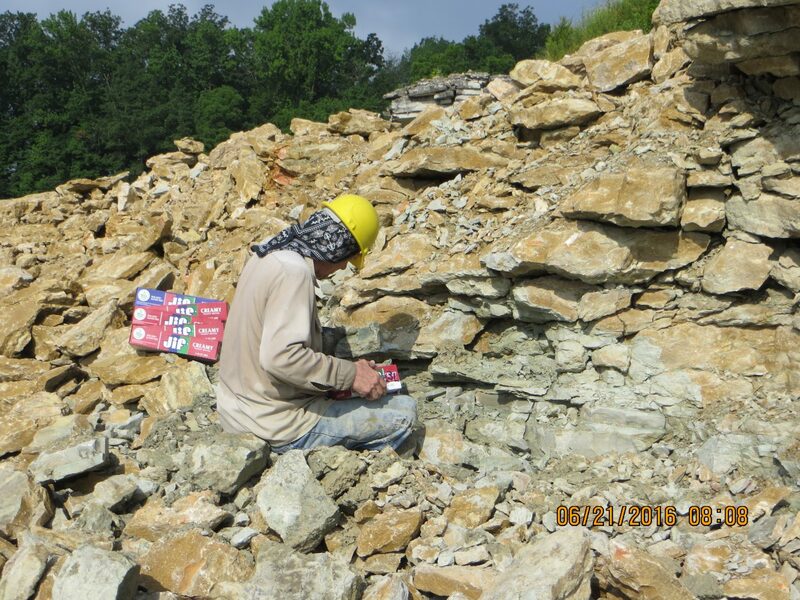 Their primary interest is analysis of conodonts (tooth-like microfossils from eel-like creatures) to determine age of the Brassfield Limestone of Indiana relative to other similar formations in the region. Conodonts are known to have changed in a predictable pattern over time, permitting their use as comparative index fossils. 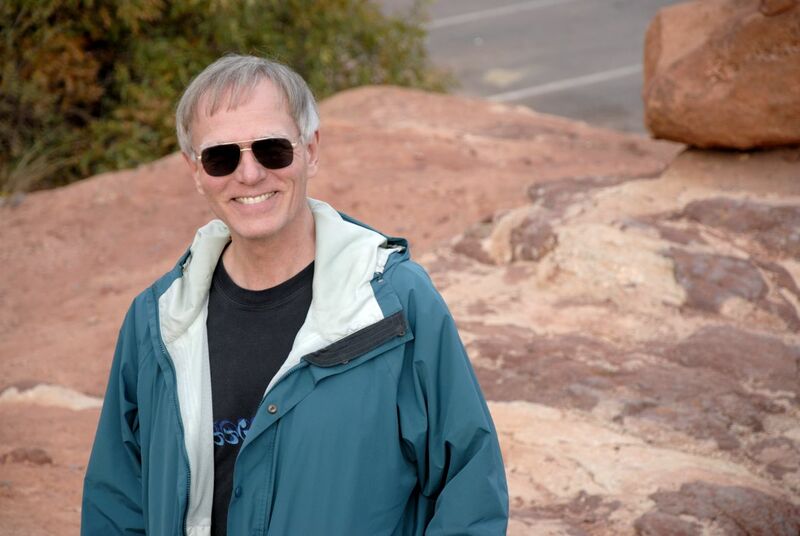 Since Dr. Kleffner was studying the Brassfield, we showed him the sea stacks, which he sampled for conodont analysis – this could help with dating the structures. Picture of some of the many types of microscopic conodont tooth-like structures. More recently, both Drs. Brett and Kleffner indicated an interest in obtaining additional sea stack samples to study. Yet Tom and I knew that the majority of the stacks and the surrounding Brassfield had been blasted away and crushed (for agricultural lime). So earlier this month, we went to the quarry to collect samples before the sea stacks were completely gone. As we feared, the previously exposed stacks were mostly gone. All that remained were a few pieces jumbled in a pile of blasted Brassfield. Regardless, we collected material from the remnants of three sea stacks. * purplish in the right hump. Perhaps the professionals can offer reasons for the color differential across the sea stack. Newly exposed sea stack that is over 60 feet across. We sampled each of the 3 humps, prying chunks directly out of the wall. Each piece of rock was labeled and placed in labeled boxes. In the end, we had collected several hundred of pounds of rock – the people in the office even teased about weighing us out before letting us leave. Don sampling the newly exposed sea stack. We look forward to learning what the professionals discover from their analyses of the rock. And, of course, are ready to refill the car if they need more!